Her body is still as stone but her eyes speak. The motionless curvaceous figure is frozen in time, but warm. As light exposes her seductive frame, music streams in and the audience senses the sculpture move. Is that imagination or is the set dancing? Even as an enchanted audience waits eagerly for the dancers to enter, the revelation takes them by surprise. The set is the cast. Rani Ki Baav, a Kathak ballet by Mukta Joshi uses performing art to tell the story of an ancient temple in Gujarat. Ironically most temple sculptures are like books in stone teaching classical dance in it purest form. So when a dancer explains how these beautiful and seemingly everlasting pillars, walls and domes could have been crafted, it seems like art has come a full circle. The ballet tells the story of how the master-piece was built. With a Vishnu idol in its sanctum sanctorum the temple was built in 1100 AD by queen Udaimati. The step well called ‘Rani ki baodi’ is an architectural marvel. A repertoire of thirty-five dancers brings to life the seven storey underground structure. Transporting the audience back in time, step by step human pillars emerge out of thin air. Dancers carve their bodies into walls depicting stories from the Puranas. Joshi interprets through poetry how each figure must have been conceived by the sculptor and then given form out of raw stone. In a span of 50 minutes the empty space of the stage as well as the imagined site of ‘Rani ka bhav’ transforms into a workshop where artists build architecture through art. ‘The young lady waits for her lover, wearing fragrant flowers, holding a mango branch in blossom’ the poetic rendition gives enough material for an artist to create, be it on canvass, in stone or on stage. The expression that woman may have had, the season when the mango blossoms, the mood created by the fragrance yet loneliness that fills her heart with both hope and dejection. Joshi feels the sculptor created his masterpiece based on his interpretation, not by creating portraits of real dancers. In Rani Ki Baav projections of actual photographs are used to create the context. Use of multimedia as a supportive element in a dance ballet can enhance the theatrical impact; a technique Joshi is not shy of using. 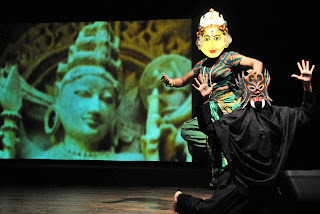 In her other production ‘Pungiwala’ Joshi used shadow theatre. An adaptation of The Pied Piper this ballet was for children and the scene of a million mice was created using shadows. However the Kathak remains pure and the music unadulterated. A disciple of Roshan Kumari Mukta Joshi is an exponent of the Jaipur gharana and the founder of Nrityadhara Kathak Research Institute based in Thane. Her other dance ballets include Bansileela and Kathak-Lavni Jugalbandi. It was on the day of his graduation that Kamlesh conducted ‘Amrutacha Vasa’, his first live program. Since then, he has organized many big popular live shows. But his real passion is niche, thought-based programs. He is the music arranger of many films and television shows, including the popular SaReGaMaPa on Zee Marathi. We talked to him about his life and times in Marathi music industry on the occasion of his recently conducted program of duets ‘Tuzhya gala mazhya gala’ at Dadar Matunga Cultural Centre. Kamlesh routinely conducts big music events attended by celebrities and large audiences. The songs selection for this program is dominated by performance-oriented and orchestration-oriented items. He wanted to do something different, program concepts that will provide a thinking challenge to him and his team. He was toying with his laptop, going through new duet compositions from the album Swaragandha, when the concept of a new program suddenly came to him. He realized that the idea of duets is much bigger than romantic songs. Devotional, lavani, phatke – a whole world of duets lies beyond the few popular types of duets, people usually hear. Kamlesh started delving deeper and deeper into this treasure land. He included some gems like ‘Chal Chal Re’ from Prabhat’s Sant Dnyaneshwar. He extended the theme to include two musicians, like the rare combination of Vasant Pawar as music director and Sudhir Phadke as singer in Awaghachi Sansar. New compositions were put alongside the classics. Slowly, the theme of the program took shape. Hosting it in a place like Dadar Matunga Cultural Centre was a challenge as Dadar Matunga Cultural Center is so particular about the quality of programs and the audience is highly discerning. But the program won the hearts of the audience. It mixed the magic of old masters with the promise of new talent. “This kind of program is the only platform where you can present more intricate and subtle music. Though I host large events, I find myself coming back to Baithak programs time and again” Kamlesh says. He insists on at least 10 rehearsals before such a program. “When the concept and content of a program is strong, the participation and positive energy that the group experiences is tremendous”, feels Kamlesh. Kamlesh ventured in the wonderland of live music right in his college days. He thanks his professor – Prof. Patankar in D. G. Ruparel college for initiating him and many like him. “Four programs a year and 30 songs per program. We graduated with a heritage of 600 songs!” remembers Kamlesh. His future was sealed when the students hosted ‘Gaani Suyashreenchi’ a program on compositions of Sudhir Phadke [Su], Yashwant Dev [Ya] and Shreenivas Khale [Shree]. Shreenivas Khale was present in this event and he appreciated Kamlesh’s talent. He went on to become a music arranger for Khalekaka’s work. Working with a legend gave him recognition – a place, in the industry. Most important has been his family’s contribution. His parents gave him unbending support in his music career, something so unusual in his middle class family. In the early nineties, he wanted a professional keyboard, but a good keyboard was not so easily available then and it was an expensive affair. His mother mortgaged her jewelery and Kamlesh got his first keyboard. His father was his moral support in the toughest of the days. Presenting duets is a mix of interaction, enacting and harmony. The casting of the program was done keeping in mind that every singer owns a certain voice quality – husky, sharp, easy and so on. The audience should be presented with a range of voice qualities in a live show to avoid the program getting monotonous. This also prompted Kamlesh to cast child artists from Varsha Bhaves’s Kalaangan. They added a variety to the program that kept the audience always interested. Reality shows mean an exceptional platform for the young. It is also becoming a good vehicle for new compositions to reach the people. Most of the times the reality shows are theme-based and compositions that fit in the theme are chosen. A theme program for Radha-Krishna naturally has a place for ‘Radha hi Bawari’. This does a lot of good to the popularity of new compositions. Young participants will learn a lot about their strengths and weaknesses and they should utilize it in their further learning in music. However, they should learn to handle the sudden rise in popularity. They should not get carried away by hype, promotion, glamor and hefty compensation they get. “In music, the journey is more important than the destination”, Kamlesh would like to tell his young colleagues. The rising wave of reality shows has inundated the quiet shores of Indian performing arts. The enchanting mix of songs, music, dance, lovable contestants, emotional parents, colourful judges and celebrities has got the Indian viewer glued to their LCD screen. This has proved to be a singular opportunity for the talented singers, musicians and such performers who can reach millions in a moment and create an impression with their talent and personality. Many feel, though, that this has somewhere shifted the attention of the Indian art student from the long climb that artistic achievement once was, to an instant flight to fame. "I nowadays get many students, asking me the 'course duration' for classical vocal", says an amused Reshmaji, who has guided a number of students in classical vocal, for the past 15 years. "I take my inspiration from my Gurus, for whom classical music was their whole life" Reshmaji says with respect. She was inspired to keep Hindustani Classical Music alive in the society by the passion of her Guru - Mr. and Mrs. Jail. She now continues to inspire her students with the same passion. But will this long and honoured tradition survive in an age when the young artists are seeking rapid success. A talk with two of Reshmaji's students give a glimmer of hope. Radhika Nande and Sumedha Karmahe - both have seen the world of reality shows from a close distance. Radhika became a favourite of the television viewers during the 'SaReGaMaPa Little Champs' show on Zee Marathi, which reached a cult popularity when it was on air. Sumedha [nicknamed "Chhattisgarh ki Barbie doll" in the show] claimed her rightful fame as a finalist on Sa Re Ga Ma Pa Challenge 2007. The experience in SaReGaMaPa Little Champs convinced Radhika even more about the significance of a a classical training. "Though she has been learning with me for a long time, the challenge and competition of SaReGaMaPa Little Champs made her focus intensely on her training" Reshmaji remembers. Radhika now devotes long hours everyday to learn the finer aspects of hindustani vocal. Sumedha has won the accolades on her natural talent and started training on classical vocal after the participation in Sa Re Ga Ma Pa Challenge 2007.. In fact, she is studying for a graduation in music from Mumbai University, along with her training under Mrs. Reshma Karmarkar Godbole. "It is because of Reshmaji that I am progressing on this wonderful path" says Sumedha. Like so many others, she has experienced that being blessed with the right Guru is the first step towards a long journey in classical music. Meeting Reshmaji and her talented disciples was an unforgettable experience. One feels the warm glow of confidence that the future fo the illustrious tradition of classical music is secure and bright in the hands of dedicated teachers like Reshmaji. the waves of reality shows will bring more and more young talented in the classical field and this flame will burn, brighter than ever. For a long time Indian classical music passed from generation to generation in the Gurukul - a broad term for a residential school of music, mostly the house of the Guru. The teacher or the the Guru choose his/ her students and took care of them in all respects, while imparting them the training. The disciples devoted their entire time to their Gurus accepting every instruction unconditionally. Life in India has changed and so has the Gurukul. Visionary maestros like Pt. Deodhar successfully created a syllabus that can be taken by music students as the beginning of learning music. A system of evaluation and certification also arose and became popular. Today, a young and hopeful music student can enroll into a reputed music teaching institute and get the initial training till she reaches a reasonable level. Then, she begins advanced training, probably under various Gurus to prepare for big performances. The training that was open to only a few determined people is now open to all, which is a big change. One aspect that has not changed at all, however, is the role that the Guru plays. The Gurus no longer run Ashrams for their students, but they impart the same passion for classical music to their students that their ancient predecessors did. 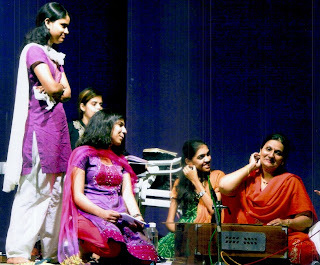 Mumbai-based Reshma Karmarkar Godbole has a long experience of preparing students in classical vocal. "I give my students the same love and attention that I received from my Gurus." Her Gurus, Mr and Mrs. Jail, gave her not only a theory training in music but an underlying zeal to carry the tradition of the Gurus. She decided to devote her life to teaching music, rather than pursuing performances. "Not every student can last the long journey that classical training needs" Reshmaji shares her experience. As she has seen, many performing artists are forced to abandon the training owing to family, career or studies. Many students stop their training during academic years like S.S.C. Reshmaji feels that this is not necessary. "One needs to devote at least half an hour daily to their practice" she says. In fact, her student Radhika Nanday says that she didnot stop her Riyaaz during her S.S.C. "I used to feel fresh for my studies after my daily Riyaaz" Radhika says. Radhika drew the audience attention during the Zee Marathi SaReGaMaPa Little Champs music contest. She also passed her S.S.C exam with flying colours, securing about 90%. Many music students fail to continue their journey, however, retain their love and respect for their Guru for life. Many of Reshmaji's old students reside abroad, but they pay her a visit whenever they come to India. Through these students, the Gurus spread the love for classical music everywhere in the world. The best Gurus do not force any particular style on their students. "Reshmatai never did any spoon-feeding" says Mrs. Desai, another student of Reshmaji. "She encourages me to develop the raaga the way I like, after she has given me her own redition." adds Mrs. Desai. She took a long break in her music training as she had to take care of her family. She is now devoting herself again to music, now that the family burden has reduced. Reshmaji's modern Gurukul has a place for her and many others who share the passion of classical music. The methods have changed, but not the spirit. The Gurus of classical music are still devoted to their one zeal in life - spreading the word of Indian classical music far and wide. 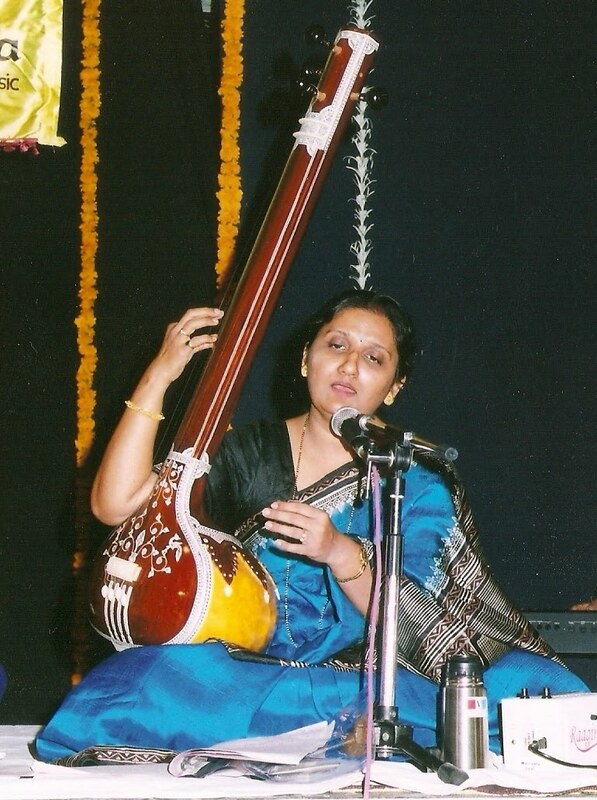 The music institute run by Reshma Karmarkar Godbole is a live example of these 21st century Gurukuls.